The garnishes that top our ramen bowls are made in house by a team of very hardworking craftsmen and ‑women. 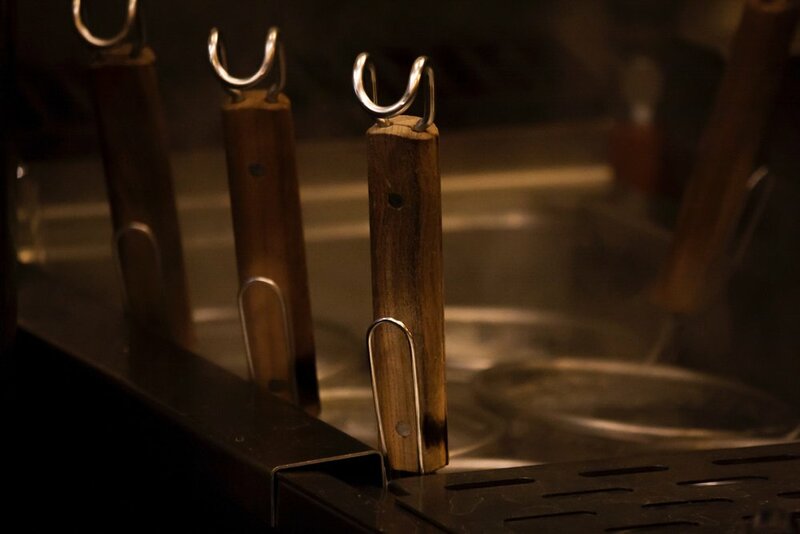 At Crafty Ramen, our chashu pork – which is our most traditional ramen topping – is made in a very untraditional way. First, we take pork shoulders supplied by Trotters, roll and tie them, then marinate them for 48 hours in our special brine. After that, we use a modern cooking method called sous vide to cook them for 12 hours at a specific temperature. Finally, right before serving, we torch them to add a delicious caramelized flavour. Our chicken breasts are also brined and cooked sous vide to maximize flavour. Other toppings, like our menma and negi, are ramen classics, but our house-cured, smoked egg yolks are a little more innovative. Then there are toppings where we’ve taken things just a step further: our Northern Warmer features butter, a common ingredient in miso ramen, but we’ve spiced it up with the addition of some fermented chilli miso. CHECK OUT THE 360 VIRTUAL TOUR OF OUR RESTAURANT!